Bonhams is a privately owned British auction house. Founded in 1793, it is one of the world’s oldest and largest auctioneers of fine art and antiques. Now, the Bonhams name is recognized internationally throughout all sectors of fine art, jewelry, motorcars and collectors’ markets. 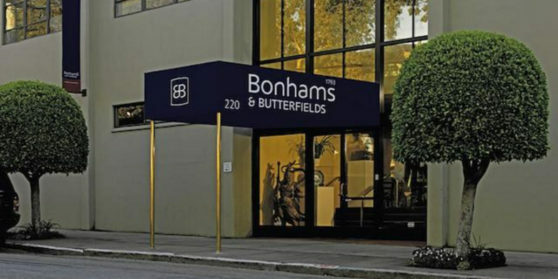 Today, operating out of its major salerooms in London, New York, San Francisco, Hong Kong and Los Angeles, Bonhams conducts some 400 annual sales through its sixty specialist departments. The same guiding principles have ensured Bonhams’ success over the past two centuries. With specialists in every major area of art and collectables, the depth of collective knowledge of Bonhams auctioneers has enabled the company to challenge the market positions of Sotheby’s and Christie’s. In 2009 Bonhams announced that it had taken market leadership in ten key areas of the UK art market for the first time including Antiquities, Arms and Armor, Watches and Clocks, Motor Cars, European Ceramics and Japanese art. In fine art, Bonhams has achieved record sums for a painting in a Russian sale (Roerich, £7.9m) and for a South African painting (Irma Stern, £3.0m) as well as presiding over the sale of the most valuable Old Master sold at auction in 2013 (Fragonard, £17.1m). Asian art continues to be a particular strength of the company and in London and San Francisco it regularly vies for market leadership in this category. The power of Bonhams’ influence and relationships in the Asian art market has been demonstrated by such sales as that of the ‘Bainbridge Vase’ for a record price and a Qianlong vase for £9.0m. Bonhams has established itself as the foremost auction house in the sale of jewelry in London, having achieved record prices in all categories, ranging from diamonds and colored stones to Art Deco and antique pieces. In early 2013, the world record price was set when a fancy deep-blue diamond was sold for £6.2m. In motoring, Bonhams continues to be unrivaled as the European number one auction house, achieving world record prices for Mercedes, Alfa Romeo, Maserati and Aston Martin. Bonhams’ impressive portfolio of salerooms in prime locations across the globe is a key component of current and future success as they provide the necessary foundation to participate in the art market at the highest levels. The New Bond Street headquarters, recently reopened after a £30m renovation program, are a testament to Bonhams’ position as a driving force and major player in the rapidly growing world of fine art and antiques auctioneering.